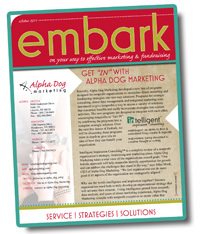 Read all about Alpha Dog Marketing! (that was sorta supposed to sound like a boy in a cap on the corner of 2nd and main selling newspapers...or in this case, newsletters...but not selling them, giving them away for free). But really....go on ahead and readour newest issue of embark.It's great! Want to receive it in your inbox? We made a handy-dandy sign up area over there to the right. (Don't fret, it's super easy to do).